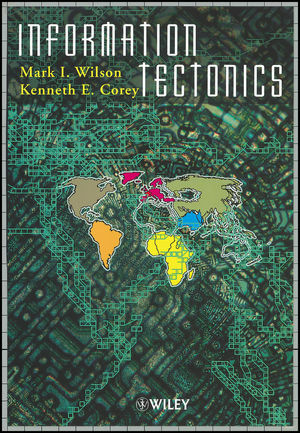 Information Tectonics spatial organization in the electronic age The rapid development and diffusion of information technologies - telecommunications, computers, the Internet - is profoundly changing the character, and structure of interaction at the local, national and international level. Information technology is usually viewed as a technical issue, with analysis focusing on hardware, software and engineering concerns for efficient management and operation. Lost from much of the debate and discussion over information technology is the role of geography and the spatial context of information technology. To further understanding and knowledge of the spatial character and geographic impact of information technology, this volume addresses three key aspects of the phenomenon. * Conceptualising electronic space and placing it into existing and developing theories of spatial and social interaction. What does electronic interaction mean for our theoretical and perceptual understanding of place and distance? * Exploration of the geographic dimensions of electronic commerce, such as financial flows, securities trade, and the re-engineered multinational corporation. How do information technologies change economic and trading relationships? How do electronic relationships change people and places? * Analysis of urban and regional development and IT, with emphasis on IT as a policy measure for urban development and regional growth. Can information technologies and intelligent cities provide the lives we want to lead? Mark I. Wilson is Associate Professor and Kenneth E. Corey is Professor and Senior Research Advisor at Michigan State University. Both are convenors on E-Space: The Electronic Space Project, which is a community of researchers, policy makers and IT professionals with an interest in the spatial impact and implications of information technology. Space, Place and Technology in an Electronic Age (M. Wilson & K. Corey). The End of Geography or the Explosion of Place? Conceptualizing Space, Place and Information Technology (S. Graham). Telecom Tectonics and the Meaning of Electronic Space (M. Wilson & C. Arrowsmith). Human Rights and Welfare in the Electronic State (S. Brunn). Telecommunications and Governance in Multinational Enterprises (E. Roche & M. Blaine). Telecommunications and 24-Hour Trading in the International Securities Industry (J. Langdale). Japanese Information Services in the Late Twentieth Century (B. Warf). URBAN, REGIONAL AND NATIONAL DEVELOPMENT. The Japanese Experience (T. Morris-Suzuki & P. Rimmer). Creating Cyber Communities in Southeast Asia (K. Corey). Australian and Indonesian Telecommunications Connections (P. Rimmer). The Economic Development of Peripheral Rural Areas in the Information Age (R. Richardson & A. Gillespie). Can Local Initiatives Provide a Strategic Response? (D. Gibbs, et al).